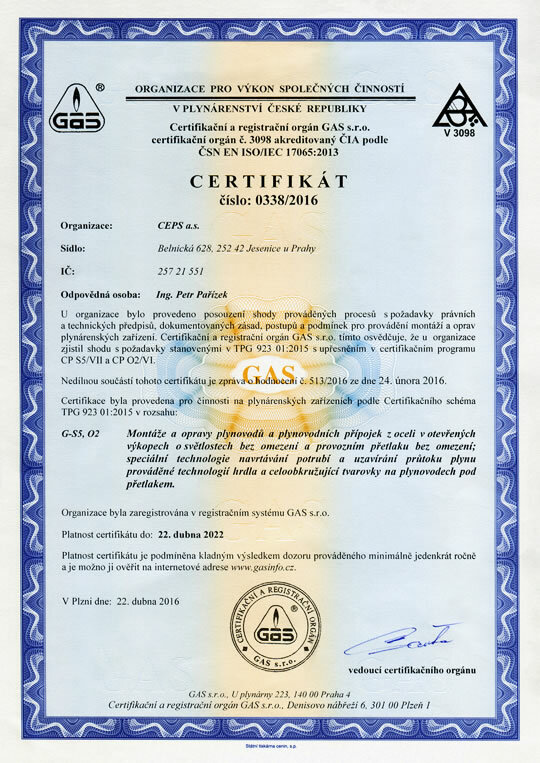 Certificate of the company certified and registered in the system GAS — CEPS a.s.
Technical level of our company endorsed the certification for activities on gas equipment in the range of G-S5,O2 – without limitation of dimensions and pressure – within the system of certification and registration of companies in the gas industry GAS. The organization was subjected to the assessment of conformity of processes carried out with the legal and technical regulations, documented principles, procedures and conditions for implementation of installation and repairs gas appliances. Certification and registration authority GAS s.r.o hereby certifies that for the organization it found concordance with the TPG 923 01:2015 requirements stipulated in the certification programme CP S5/VII and CP O2/VI. An integral part of this certificate is a report on the evaluation No. 513/2016 of 24 February 2016. Certification was carried out in accordance with TPG 923 01:2015 certification scheme for activities on gas equipments in the range of G-S5,O2 Installations and repairs of pipelines and steel pipe connections in open trenches with internal diameter without limitation and operating excess pressure without limitation; special technology of drilling pipes and closing of the gas flow performed by technology of neck and whole-circling fitting on over-pressured pipelines. The organization was registered in the registration system at GAS s.r.o. Validity of the certificate is conditioned by positive result of the supervision carried out at least once a year and can be verified online at www.gasinfo.cz.